Back to business! This cake is killer. I just remembered that I love condensed milk in my coffee, then I remembered I should probably do other things with it besides just stirring it into coffee. Somehow I remembered this recipe, and it's been on my mind for days. So I went out and bought a can of evaporated milk and some cream, since I had everything else. I got out of work early, and even though it was 90 degrees (still? Isn't summer over?) decided it was a good idea to bake a cake. I was right. It was a good idea to bake this cake. I should have gone with my gut and halved this, because it's a real big cake. At my house, it's just me and Alex. Even if we eat a lot of cake it will take us a long time to finish this. I might freeze half. 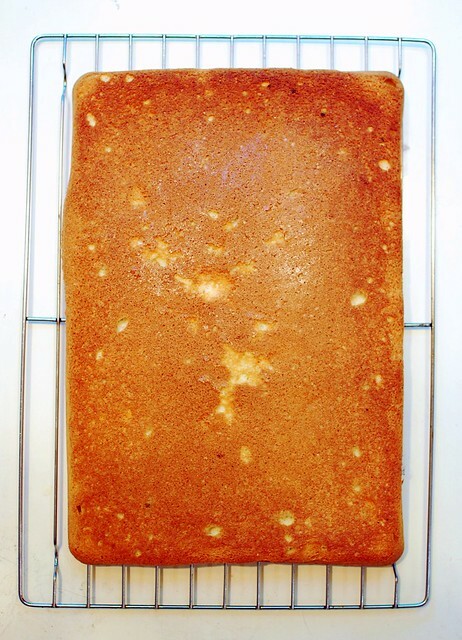 Anyway, this cake is pretty easy, as long as you're not afraid of beating egg whites. 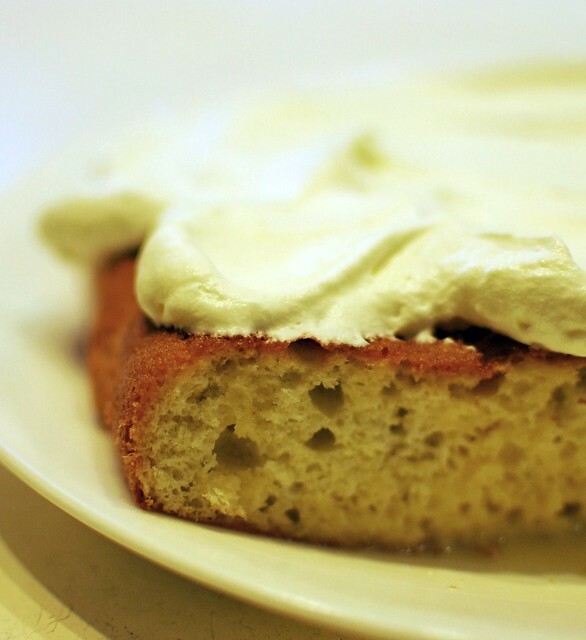 You make a quick sponge cake, let it cool, pour a bunch of milks all over it, and top with whipped cream. As long as you have a stand mixer, this cake is, well, cake! It is delicious, I must say. I was pretty sure I wouldn't like it, since I don't like soggy things. Don't get me started on soggy cereal. Ugh. I did like it! So much that I might even forget to eat dinner and eat another piece. Preheat oven to 350, and grease a 13x9 pan. Stir together the flour mix, xanthan gum, baking powder, and salt. Beat the egg yolks with 3/4 c sugar until light yellow, then stir in the milk and vanilla. Stir into the flour mix and set aside. 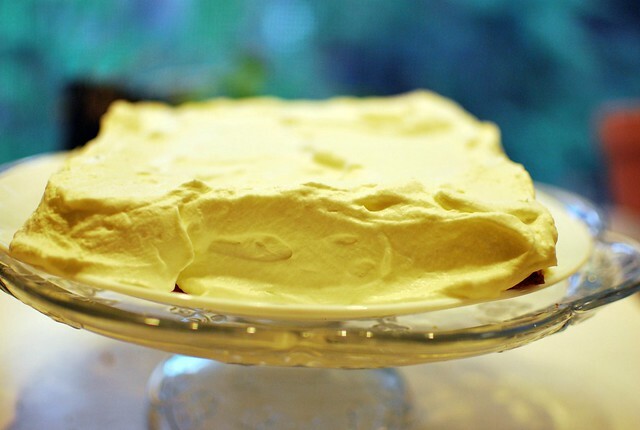 Beat the egg whites until it holds soft peaks. Add in the 1/4 c of sugar, and beat to stiff peaks. Fold the whites into the yolk-flour mixture gently and spread into your greasy pan. Bake 30-40 minutes, until the cake starts to pull away from the edges of the pan, it's golden brown, and a toothpick comes out clean. Cool the cake, then prick all over with a fork. Combine condensed milk, evaporated milk, and 1/4 c cream in a bowl. Pour about 2 cups of the mix over your cake, slowly, letting it absorb. Here's where I disagree with the Pioneer Woman - she says to toss the rest of the creamy mixture, I say keep it and stir it into your coffee in the morning. Anyway, let the cake stand for half an hour or so. It will absorb almost all of the liquid, if not all. Dump the rest of the cream into a mixing bowl with the remaining 3 T of sugar. Beat on high for a minute or three until the cream and sugar turn into whipped cream. 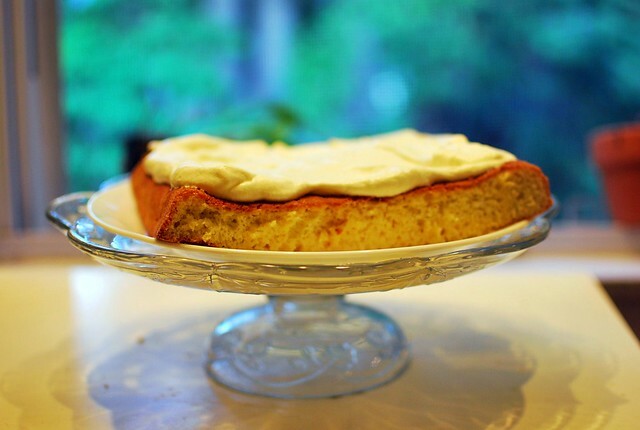 Plop the cream on top of your cake and spread around over the top and down the sides. I always love your cake recipes so i'll have to give this one a try too. this looks like the perfect cake to replace the lack of cake in my life over the past year. can't wait!!! Yeah, why toss the leftover creamy mixture? This looks delish. I love tres leches.